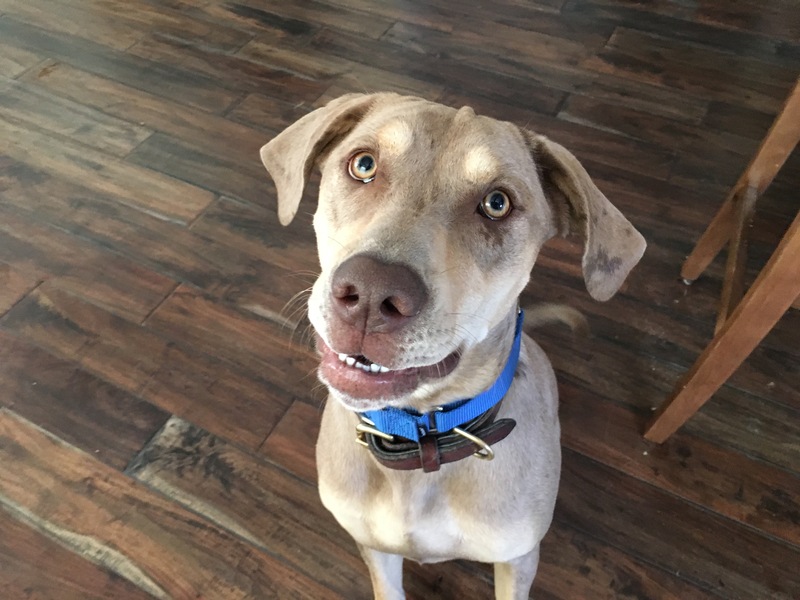 Suede is a 10 month-old Catahoula Leopard Dog who gets very excited when guests arrive, likes to jump up and get as much attention from his guardians and guests as doggily possible. When I arrived for the session, Suede took turns jumping up on the couch that was facing the window in the front of the house to a table that was right next to the front door. Her guardian made a halfhearted attempt to get her off of the furniture but at the same time petted her in an attempt to console or reassure her that my arrival was OK. The problem with this behavior is that when we pet a dog who is in an anxious or excited state, we are actually agreeing with whatever behavior they are exhibiting at the time. This could certainly be part of the reason that Suede’s greeting went from excited to semi territorial once I came inside the home. It will be important for her guardians to use the technique that I detailed in the exercise to disagree with this unwanted behavior rather than petting her or attempting to pull her away. I always want to get the dog to do the work themselves rather than pushing or pulling them. By using body language, movement and positioning as described in the above video, her guardians can more effectively communicate to her that the guest’s arrival is not something to be alerted about. When we sat down in the living room to discuss Suede’s behavior and what her guardians wanted to accomplish with the session, the dog took turns violating the personal space of everyone in the room. Not only did she show no regard for personal space, she demanded attention from her by climbing on, nudging or demanding their attention by her proximity. Because her guardians instinctively petted her each time she did this, they were also reinforcing of this behavior. I pulled out a leash and attached it to Suede’s collar so that I show them a more effective way to disagree with this unwanted behavior. By consistently applying this consequence when the dog refuses to listen or gets over excited, her guardians can effectively communicate to Suede that they want her to respect their personal space and that there is a consequence to her actions when she fails to do so. To further help the dog give up this unwanted behavior, I suggested that her guardians adopt a technique that I call Petting with a Purpose. If her guardians are consistent about petting the dog for desired behaviors this way, it won’t take long for Suede to start engaging in these wanted actions to get her guardians attention instead of invading their personal space or nudging / pawing at them as she had been doing. While Petting with a Purpose is probably one of the easiest ways to help redefine the leader follower dynamic between canine and human, I also wanted to show her guardians how they could disagree with her when she failed to listen. These escalating consequences are based on social cues dogs use with one another. As a result, most dogs pick up on them immediately and understand their meaning. If her guardians consistently apply these escalating consequences with good timing, they will find that they gradually need to employ less and less of them. Eventually all they will have to do is use the hissing sound to disagree with the dog. These nonverbal communication cues and escalating consequences are most effective when applied with good timing. I explained to Suede’s guardians how important it is to disagree with her before she starts the behavior if possible, but if not, to do so immediately as soon as it starts. One of Suede’s particularly unwelcome habits was her propensity to over bark. In her case a lot of it was demand barking for attention. I never want to stop a dog from barking completely as alerting us to dangers or things to be aware of is certainly something that is a good job for a dog to have. But that is generally accomplished in three or less barks. I suggested that her guardians start to apply these escalating consequences and disagree with the dog’s barking the second she barks for the fourth time. It will be extraordinarily important that her guardians are consistent with the application of their disagreement the second the dog barks the fourth time. If the timing is good, eventually the dog will understand the three barks is OK, but anything past that receives a correction. I’m guessing that giving Suede a leash-timeout for over barking is a consequence that will be applied quite a bit over the next week or two. If they consistently disagree and apply this time out with good timing, it shouldn’t take long for Suede to give up on her old habit of demand barking. Next I demonstrated a leadership exercise that I developed a few years ago to help humans practice using the escalating consequences and the dog practice restraining itself. As you can see in the above video, the leadership exercise can be challenging. It requires precise timing and for the human to pay complete attention to the dog. One of the reasons that Suede did not respect her guardian while completing this exercise the first time was because the guardian was consistently late in turning her hips and shoulders to face the dog or step forward when the dog got to close to the treat on the floor. The idea is to hiss at the dog when it approaches the three-foot boundary around the treat and to suddenly start marching directly at the dog any time that it crosses this three-foot line. You want to give the dog an almost flinching experience by your movement so sudden and deliberate is the name of the game. Because the guardian was hesitant in her movements and stopped short of touching the dog rather then marching through her, Suede ignored her rebuttals and attempted to go through or around her to get the treat. We reset the exercise after going through a couple of tips and suggestions on her technique and this time the guardian got a much better response. I suggested that both of Suede’s guardians practice this exercise with her multiple times a day while gradually increasing the length of time they ask her to wait before getting her treat. It’s extremely important that they practice this exercise every day until they’re able to get the dog to remain laying down for a full 15 minutes. Usually once a dog reaches this time threshold, they have sufficiently developed their ability to self restrain and have adopted a more robust respect for the guardian’s authority. Now that the dog had had some practice at deferring to her guardian’s authority and they had sufficient practice disagreeing with unwanted behaviors, I wanted to show them how they cold apply these techniques to Suede’s behavior at the door. I had one of her guardians go outside and play the part of an arriving guest so that we could practice claiming the doorway from the dog before opening the door for a guest. Security for the pack is usually handled by the senior ranking dog. By taking over this duty from Suede, her guardians will make it easy for the dog to adopt more of a follower mentality. By the end of the session, Suede’s behavior was much improved. She was looking up to her guardians for direction and leadership as well as responding to their commands and corrections right away. Many of Suede’s unwanted behaviors are a result of her youth; puppies are always rambunctious. But now that her guardians know how to communicate what they do, and do not want from her in a way that she understands, it shouldn’t take long for them to put a stop to the rest of her unwanted behaviors permanently.